Beavercreek senior forward Kirsten Williams is double-teamed by Centerville’s Alexis Hutchinson (1) and Kelsey George (24) in the first half of Wednesday’s girls high school basketball game at Beavercreek High School. Sophomore Alyssa Hargrove-Hall (4) led Beavercreek with 13 points scored in the Feb. 6 loss to visiting Centerville. 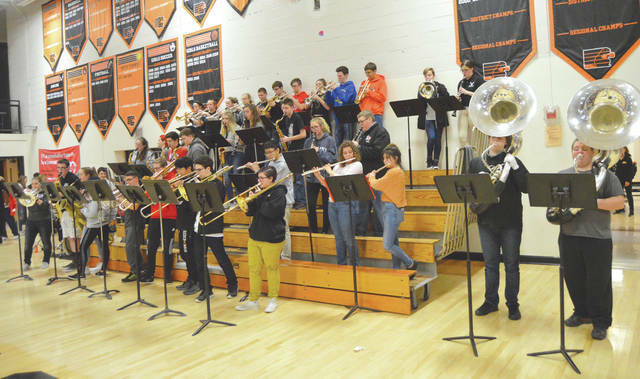 The Beavercreek Pep Band entertained the crowd during Wednesday’s girls high school basketball game between host Beavercreek and the Centerville Elks. 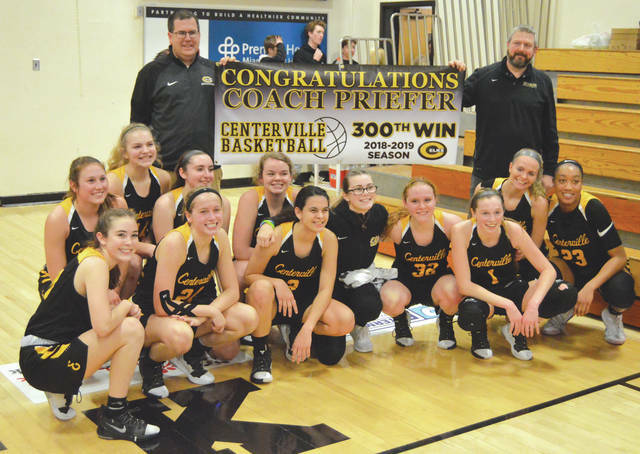 The Centerville Elks girls high school basketball team surprised coach Adam Priefer (back row, left) with a banner commemorating his 300th career victory, after the 54-37 win, Wednesday Feb. 6 at Beavercreek High School. 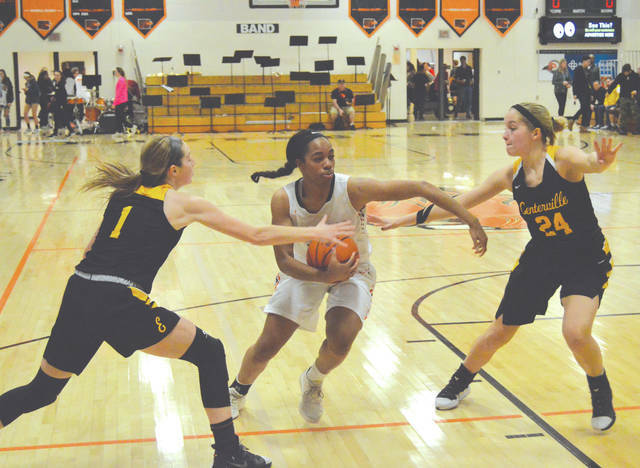 BEAVERCREEK — Centerville’s full-court in-your-face defense pestered Beavercreek into 19 turnovers, enough to take the Beavers out of their offensive rhythm while getting the Elks into theirs. Centerville led throughout Wednesday’s Feb. 6 game to claim the outright Greater Western Ohio Conference East Division title with a dominant 54-37 win. Even Beavercreek coach Ed Zink came away impressed with how the Elks played defense. Talented freshman Cotie McMahon led the Elks (20-1, 11-0 GWOC East) with a game-high 20 points, Amy Velasco scored 13 points and Alexis Hutchinson added 10. Centerville wraps up its regular season with a 7:30 p.m. game Saturday, Feb. 9 in Huber Heights against Wayne, who happens to be the only team that has scored 60 points against the Elks this season. The Elks surprised coach Priefer by unfurling a banner after the game in celebration of his 300th career win. The team also received the 2019 GWOC East Division champions trophy. 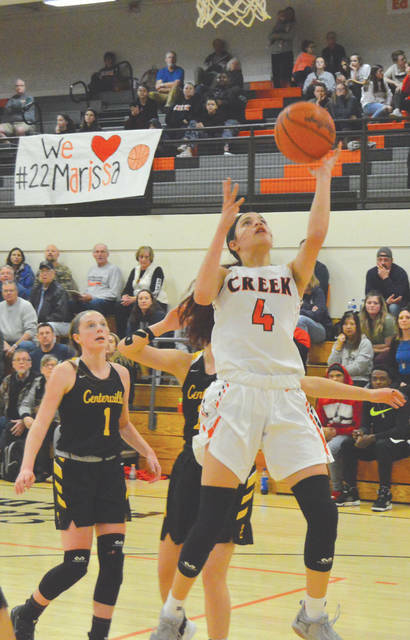 That pesky never-die full-court defensive pressure prevented Beavercreek from enjoying any kind of a shooting rhythm on offense. It was rare that a Beavercreek player would have an uncontested shot. Priefer said that was the plan all along. Beavercreek sophomore guard Alyssa Hargrove-Hall leads the Beavers in scoring with a 10.8 points-per-game scoring average, and she finished with 13 points to lead the team Wednesday night, but Kirsten Williams was held to seven points, while Morgan Rhoades and Taylor Steinbrenner finished with six points each in the loss. Beavercreek (13-8, 6-5 GWOC East) was limited to two points scored in the final quarter. The Beavers will close out the regular season on the road at 7:30 p.m. Saturday, Feb. 9 when they head to Kettering’s Trent Arena to take on Fairmont.